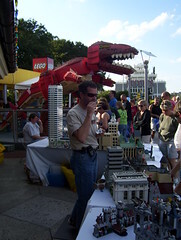 My LEGO club, the Greater Florida LEGO Users Group (or GFLUG for short), will be displaying our LEGO creations at Downtown Disney by the LEGO Imagination Center store November 9-11, 2007, from 10am – 5pm daily for Festival of the Masters. This year’s theme is ‘Vs.’ as in Spy vs. Spy (from Mad comics), Robots vs. Aliens, Giant Spiders vs. Tanks, etc. Here’s some pictures from last year’s display. Come out, there’s fun for the whole family. Chalk artist on the sidewalks, art booths everywhere, and LEGO.